Free Stuff to Promote Animal Adoption! Need help with marketing your pet rescue efforts? 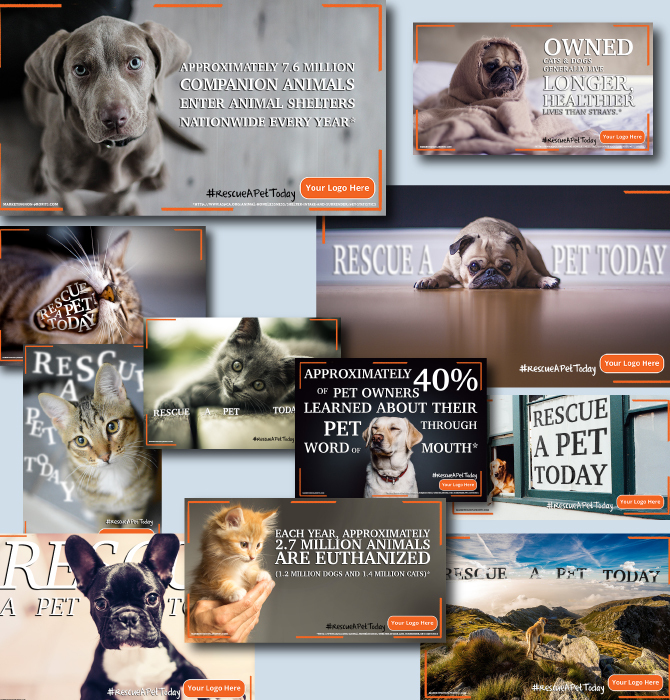 We at MarketingNon-Profits.com have created a marketing campaign to support your pet rescue mission and a dozen of the social media images are free. Included are images you can use to share your perspective on the importance of pet rescue. Below are a few of the images you will receive included with our FREE PET ADOPTION MEDIA KIT. Send us your email and the downloads will be sent to you within 24 hours. The logo in the bottom corner can be replaced with your logo and within minutes you will be ready to start sharing on social media! We have recently been in touch with Maddie’s Fund and received some great feedback on the video. We are offering this resource to you in order to promote our “rescue a pet” campaign. You can sign up below to get your free downloads. Please contact us at 513-474-1158 if you have any marketing questions about your non-profit organization and fill out the form below to receive your FREE PET ADOPTION MEDIA KIT! Would you like to discuss your non-profit with us?